[size=30]A wattmeter is a meter that measures watts. [/size] That should be the end of the story. But, it isn’t. You guys know that I’m going to tell you a lot more detail than that, right? 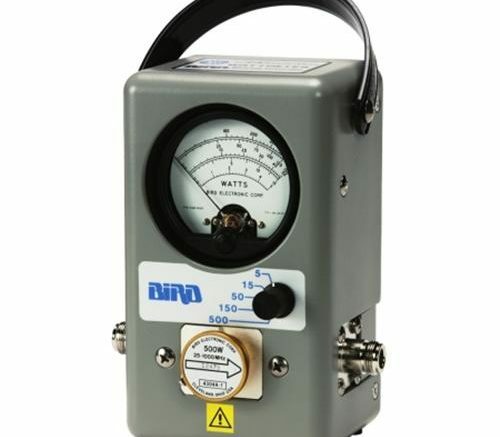 A wattmeter is a professional instrument designed to measure the current flow through high-capacity lines. Actually, it’s usually that. You could use the term “wattmeter” for something like this Kill-A-Watt. It measures the electricity flow at the outlet, but generally it refers to a professional quality instrument. And so I need to go back a little bit further. which you can watch in your spare time. Or, you can just trust me that watts is a pretty good way to know how much power you have. For those who don’t have 7 minutes to watch, a watt is a measure of how many volts and how many amps are flowing. One watt = one volt x one amp. So, if you’re a commercial power company employee or even someone who works in a broadcast tower, you need to know what’s going on in your high-capacity lines. You need to know if it’s flowing the way that it should. And, possibly more importantly, you need to do this without actually killing yourself. That’s where one of these commercial wattmeters comes in. They’re super-over-built so that they can take the really high voltage and high load. That’s important if you’re working with wires before they come into your home. This is the kind of power that would blow up a plain old outlet tester and probably you with it. So, even if you’re a real fan of measuring devices (as I am), you probably don’t need a wattmeter. Unless, of course, you’re going to be messing around with large amounts of electricity. What you really need instead is a multimeter, which can do a whole lot of things including reading volts and amps from batteries or even outlets if you’re super careful. But, let’s say for a minute that you are that sort of person that uses a wattmeter. Solid Signal has a surprisingly massive selection of wattmeters and elements. Most of these commercial wattmeters have interchangeable elements so they can be used in different scenarios safely, and you can configure your wattmeter so it works properly for your specific need safely. And yeah, I know I said regular people don’t need a wattmeter, but now I really want one. I don’t know why, I just do. Should you choose professional cell booster installation?